Foulques de Raigniac at Gaspard Yachts tells me there's a further €1,050,000 price drop on the 36.5m motor yacht Firouzeh. 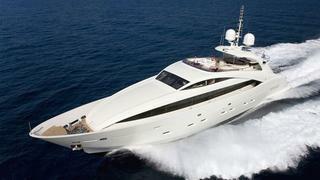 Delivered by ISA in 2007, Firouzeh has had only one owner and has been immaculately maintained. There is spacious accommodation for up to 12 guests in a main deck master suite, two double and two twin staterooms plus Pullman berths. Deck spaces are extensive, including a flybridge with large dining area, Jacuzzi and bar. Firouzeh is now down from €6.9 million to €5.85 million.